Learning to build a word family is an important pre-reading activity. Turn learning into a fun game for kids by letting your child use some colorful sticky notes! I have been doing a lot of activities with my son to help us focus on some Back to School Basics skills. We’ve been working on simple pre-kinder and kindergarten level math, writing, and pre-reading activities. 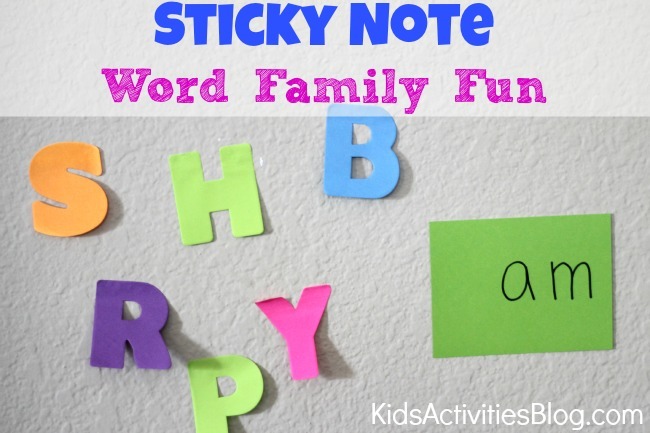 Today I am going to share a very simple activity we came up with using letter sticky notes to practice making word family words! My 4 1/2 year old son loved it! Simply place a variety of sticky note letters on the wall along with one note card with one word family ending on it. 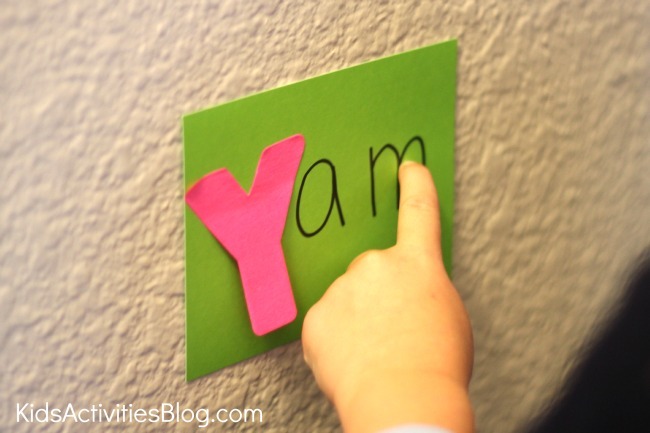 Have your child move the sticky letters to the front of the note card and practice reading the word. Some of the words your child makes will be positively silly and not make sense and some of them will be actual words. Just have fun playing around together and practicing sounding out new words!! Once you’ve done one word family ending for awhile, choose and new one and try reading new words. You can even have your child create a silly sentence using the new words that they come up with! This game for kids can also be done with magnets on a magnet board or using stickers on a piece of paper. We loved doing it on the wall with letter sticky notes because they were something new and fun and made the activity a little more exciting. Do you have any other favorite ways to play with word family words? This is really good games for the kids. Having fun with letters and put them on wall is really good game for kids. And the letter is available with magnets so that’s great.